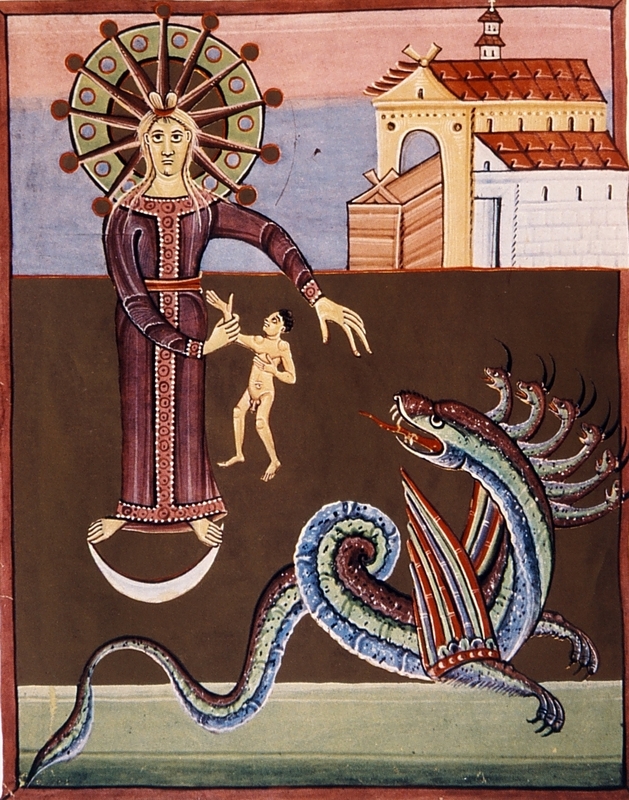 The Woman, the Child and the Dragon, Bamberg Apocalypse (11th C) with anatomically correct child. I begin the episode by explaining the Catholic Encyclopedia‘s early 20th C. classification of the last half of Revelation as a Divine Drama in five acts: Act 1 is Chapters 12, 13 and 14; Act 2 is Chapters 15 and 16; Act 3 is Chapters 17 and 18; Act 4 is Chapters 19 and 20; and Act 5 is Chapters 21 to 22:17. Revelation 22:18-21 is treated as an Epilogue. I will be using the CE’s classification system throughout the rest of the episodes in the series. 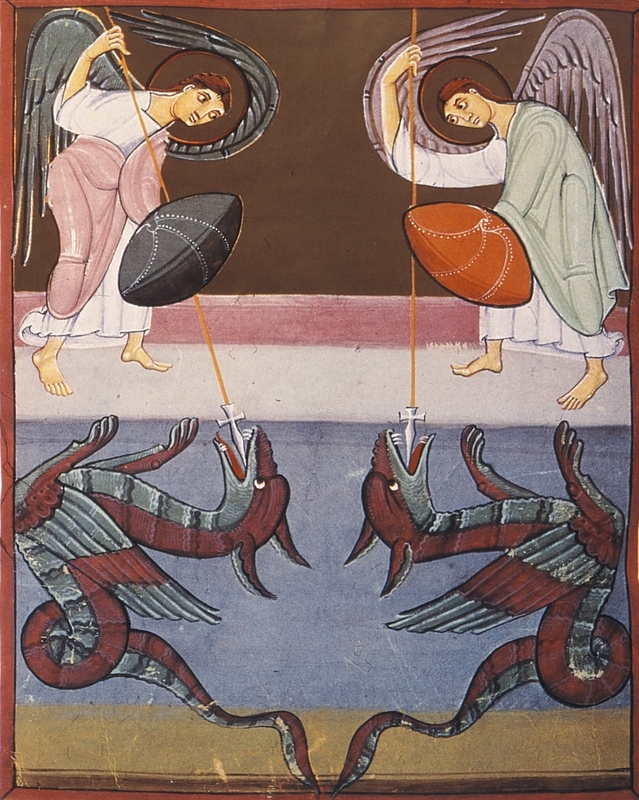 The first illustration is from Folio 29 in the Bamberg Apocalypse. The anonymous Bamberg artists offer anatomical accuracy which leaves no doubt that the child in the Woman’s hand is a male. The Beast from the sea with seven heads with diadems seeks to devour the Child and destroy the Woman. Significant incidences of numerology in Chapter 14 are 3 (signs in heaven); 12 stars (surrounding the Woman’s head); 7 (heads and diadems of the Dragon); 1/3 (stars thrown to earth); 1,260 days (Woman’s time the place prepared by God); “Time, times and half a time” (from Daniel 7:25 and 12:7 re the refuge in the Wilderness). The episode includes a Primer on the Jewish and early Christian understanding of the Serpent/Satan/Devil connection, illustrated with a detail from a stained glass window and quotations from both the Old and New Testaments. Michael Fights the Dragon, Folio 31, Bamberg Apocalypse. I used a 2nd illustration from the Bamberg Apocalypse for verses 7-12, the account of the war in heaven between angels loyal to Satan and those loyal to St. Michael the Archangel. The Scriptural allusions in Revelation 7-12 are illustrated with Old and New Testament precedents, including Job, Isaiah, Exodus, Daniel, Matthew and Hebrews. The third illustration is the Dragon pursuing the Woman in the Wilderness (not included in this Blog post). I am have finished the slides and script for Episodes 18 and 19 and expect to have Episode 20 ready for sound recording early next week. These episodes will be released, one per week during August.